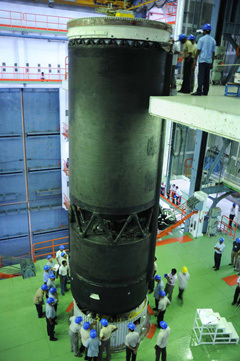 The doomed launch of India's most powerful rocket in April was brought down by a turbopump failure in the vehicle's homemade third stage engine, the Indian Space Research Organization announced Friday. The Geosynchronous Satellite Launch Vehicle, or GSLV, blasted off April 15 from India's east coast, but the $70.6 million test flight abruptly ended less than 5 minutes after launch. The GSLV's indigenous third stage, flying for the first time, did not develop the required thrust due to a mishap in its liquid hydrogen turbopump, ISRO said in a statement. ISRO said its engineers traced the problem to two potential causes. The scenarios include "gripping at one of the seal location(s) and seizure of rotor and rupture of turbine casing caused probably due to excessive pressure rise and thermal stresses," the statement said. Engineers say the third stage ignition sequence started as predicted 294 seconds after liftoff, and both the main engine and two steering thrusters worked as planned for approximately 2.2 seconds, based on acceleration data from the rocket. "However, the thrust build up did not progress as expected due to non-availability of liquid hydrogen supply to the thrust chamber of the main engine," the ISRO report said. The hydrogen turbopump also started up normally, reaching a peak of 34,800 rpm at nearly full power. But the pump speed started dipping after less than a second and stopped completely moments later, according to ISRO. The third stage failure put the rocket in an uncontrolled spin and it crashed back into the atmosphere over the Indian Ocean. Although the flight's primary objective was to test the new third stage, the GSLV was carrying an experimental communications and navigation satellite. The ISRO press release said the rocket's new navigation and computer systems and the new composite payload shroud all worked as expected during the April launch. 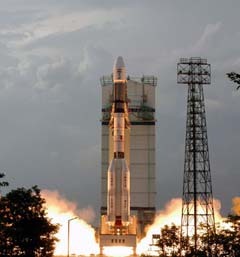 India developed the new cryogenic third stage to replace a Russian engine used on the GSLV's five previous flights between 2001 and 2007. The Russian stage was blamed for two minor glitches in 2001 and 2007 that stranded payloads in slightly different orbits than planned. A liquid-fueled strap-on booster triggered a dramatic explosion shortly after a launch in 2006. Three other GSLV flights were completely successful. Russia sold India seven engines in the 1990s, and two of the powerplants remain in ISRO's inventory. ISRO said Friday the next two GSLV flights will use the older Russian third stage, while another launch of the Indian-built cryogenic engine should occur within a year.